Few contemporary musicians are as loyal to their influences as Johnny Winter‚ so it's perhaps inevitable he'd make an album of blues covers. Roots is a collection of the Texan's favorites tunes in the genre and reminds why he retains his status as a guitar hero. Not that there's anything innovative here in cuts like "T-Bone Shuffle‚" but hearing Winter and Sonny Landreth trade solos compensates for lack of groundbreaking gestures. There's a sly tone in Johnny's singing that favorably alludes to his colorful past‚ making the tune subtly self-referential if not exactly autobiographical. And actually‚ that personal aspect of Roots is what makes it worth having. 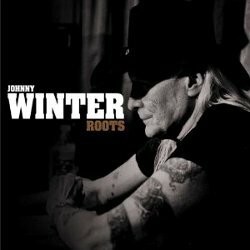 Whether or not you're cognizant of the twists and turns of Johnny's Winter's earlier career‚ he brings a presence to these standards that compares favorably with the work of veteran bluesmen through the history of the music. The presence of guests thus becomes an additional virtue even when it's somewhat predictable‚ as in the case of Warren Haynes playing slide on "Done Somebody Wrong‚" a perpetual inclusion in the repertoire of The Allman Brothers Band; on Roots‚ the tune functions as a reminder of the legacy of Elmore James‚ arguably the pioneer of electric slide playing the likes of which the late Duane Allman popularized during his lifetime. And there's a discernible logic to the roster of invitees even if some‚ like John Popper on "Got My Mojo Working'" aren't genuinely inspired in collaboration with Winter. In contrast‚ country perennial Vince Gill lights things up as bright as the headliner in his solo and fills on Chuck Berry's "Maybelline." "Bright Lights Big City" is most as notable‚ as it features Susan Tedeschi whose vocal tone is as knowing in its own way as Winter's. Tedeschi's significant other Derek Trucks distinguishes himself with absolutely incendiary playing on "Dust My Broom." Johnny's sibling Edgar adds a smoky jazz atmosphere appropriate to "Honky Tonk‚" but it doesn't compare to Trucks' contributions which elevate the musicianship all the way round (the band here is Winter's own backup group‚ including producer/guitarist Paul Nelson). Johnny Winter himself is clearly moved by Trucks and the effect is similar on the closing cut "Come Back Baby‚" where the participation of John Medeski (of Martin & Wood fame) adds another legitimate shot of jazz to the proceedings: his Hammond organ lines are as haunting as the lyrics and complementary horn arrangement. Culminating in such memorable fashion renders Roots a distinctive entry in Johnny Winter's discography. It bodes well for future recordings‚ particularly if the man chooses to explore more deeply such stylist avenues as this‚ the longest cut on the cd. Blog: Video: American Babies - "Joeline"
Blog: It's Mountain Jam Time!